There is a flock of ibis in the lower corner, following the big arrow to their roosting grounds in the Fl Everglades for the night. My father and grandfather were both hunting guides as one of their many jobs in this part of South Florida. That was long before the swarm of retirees arrived. It's still pretty nice out here in the middle of the state. 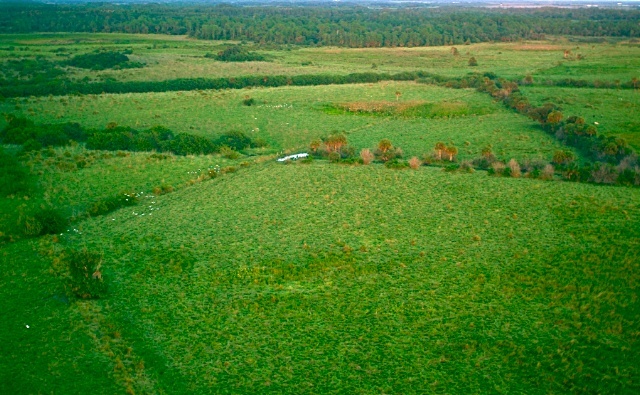 This is cow pasture and ponds covered with vegetation. This was shot handheld, through a plexiglass airplane windwow, so sharpness suffered. Detail is pretty good at full size. The lens used was a 1960's pre Ai Nikkor 35mm f2 Nikkor "O" modified. It was near dark when I shot this. Basic edit in iPhoto, move to Graphic Converter for tweaking brightness and color correction, sharpen, resize for upload. It is pretty, Lucious, and GREEN! Nice viewpoint but where are the birds? I love the color and exposure. I think the composition is a bit off as I'm not really sure where to focus my eyes. Proudly hosted by Sargasso Networks. Current Server Time: 04/25/2019 11:45:12 AM EDT.